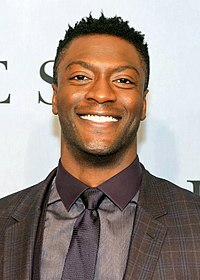 Aldis Alexander Basil Hodge, nome completo de Aldis Hodge (Condado de Oslow, 20 de novembro de 1986) é um ator norte-americano, conhecido por interpretar Alec Hardison na série Leverage e MC Ren no filme Straight Outta Compton. Ele é irmão do ator Edwin Hodge. 2000 City of Angels Marcus Hall "SWATs Happening" e "Lake Erie"
Charmed Trey "Long Live the Queen"
American Dreams (Não creditado) "Rescue Me" e "Another Saturday Night"
Girlfriends Matthew Miles "The Game", "Good News, Bad News", e "L.A. Bound"
2006–2007 Friday Night Lights Ray "Voodoo" Tatum "Wind Spirits", "Who's Your Daddy", "Git'er Done", "Best Laid Plans", e "State"
2007 Supernatural Jake Talley "All Hell Breaks Loose Part 1" e "All Hell Breaks Loose Part 2"
2008 CSI: Crime Scene Investigation Tony Thorpe "Too Tough to Die" e "The Happy Place"
2010 Mad Usher, Sinestro, Frog (voz) Episode: "WALL-E-NATOR/Extreme Renovation: House Edition - Superman's Fortress of Solitude"
Esta página foi editada pela última vez às 00h16min de 27 de março de 2019.